I always shop/refresh very early in the new season, and will wait months before I can wear a new piece if I need the weather to co-operate. I usually stop shopping mid season and am not enticed by sales. This strategy works for me - although it might not work for you. COS Cropped Watermelon Pullover : (Not as pink in person). LUXE and stunning. Spring cashmere makes a lot of sense in Seattle and Salt Lake City. COS welded ink blue silk knit polo shirt pullover. LUXE and delicate. Gorgeous with skirts too. Love it with my pearls. Peppy '80s Fabness. Boden Cropped Straights Jeans in tomato red. DELICIOUS colour and fabric. Not too tight. Not calf-sucking. Needs waist and hip alteration so that's where they are now. Amazing with the COS watermelon pullover and white boots. VERY excited to wear the combo! Boden Cobalt Jersey Midi. Super soft, extremely comfortable, very flattering on a range of body types, and easy to maintain. Lightweight get covered, and drapes like a dream. Nice skirt swoosh too. There’s a V-neck at the back, so make sure you’re okay with that. It’s high enough to cover the bra strap.It’s shorter on me than on the model but still very midi. I’m going to wear it with white and blush pink footwear and bag, and throw in a blush pink scarf for sun protection when I’m walking in blazing heat. (Comes in other patterns and colours). BR simple body con layering tops in red and pink: Not quite as good as last year's version, but good enough. (ETA): Treasure & Bond Cropped Sweater in Yellow: I HOPE the quality lasts. It's great at the moment, and works with a slew of bottoms, and hopefully with the new KM skirt! *I can wear everything accept the dress right away. Ralph Lauren Red Pants: Itchy and not well made. Ridiculous for $268! Boden Cuffed Wide Crops: DIVINE, but sized out in the smallest size and too big to alter. BR High Rise Wide Legs: So fun with my big white sneakers! Quite nice fabric. But sized out in the smallest size and too big to alter. Habitual Convertible Jeans: I can't sit in them with the cuffs fastened. Funny leg fit. How did that pass QA? AG Straight Leg Jeans: Too simple and soft. I like hard denim with bells and whistles. Lovely though, if that's your thing. Great on a curvier body. Boden Kathrine Midi Dress: The green looks dull against my skin tone. Too muted, and too big to alter. Very pretty and romantic though. AFRM Bias-Cut Skirt: Horrible fabric. Schmutters. Love the colours! Thanks for the reviews. Such nice pieces you have got, Angie! I love the COS watermelon sweater especially. And so glad you found new tomato red trousers. Pity the neon green sweater was not practical, it is sooo pretty. Surprised about the Polo RL trousers, one would definitely expect more. Ohhhh, you have scored some great items ! The Boden cobalt jersey midi is gorgeous, you wear this style so well:). And the tomato red crops...love those ! Lovely pieces. I might take a look at the AG jeans that were not your thing. Too bad about that lovely lime green top. Such a delicious colour. Your keepers look so perfect for you! Especially that midi dress. Too bad about that bias cut skirt — it looks pretty in the photo. I checked out that AG jean but of course the wash that appealed to me is not available in my size. The Boden Maisie is so perfect for you! If it didn’t have the V in the back, I’d be ordering one. The wide cuffed crops, on the other hand, might just end up in my next Boden order, maybe in the yellow! Too bad about the bias cut skirt. Was it TopShop? Or the AFRM one in the finds? Taylor, the crops are going to fit really well after alterations, and I'll show the forum. Kathetina, I seem to do well with COS knitwear and dresses despite my small frame. Janet & Style Fan, I think you'll like the AG jeans. Hope you get your sizes. Kathie, good catch. I changed it. The Boden Hambledon pants are DIVINE. lovely fabric and cut. Go for it. You found your red pants! Hope we get to see you in the ensemble above. And schmutters! You're killing me ! 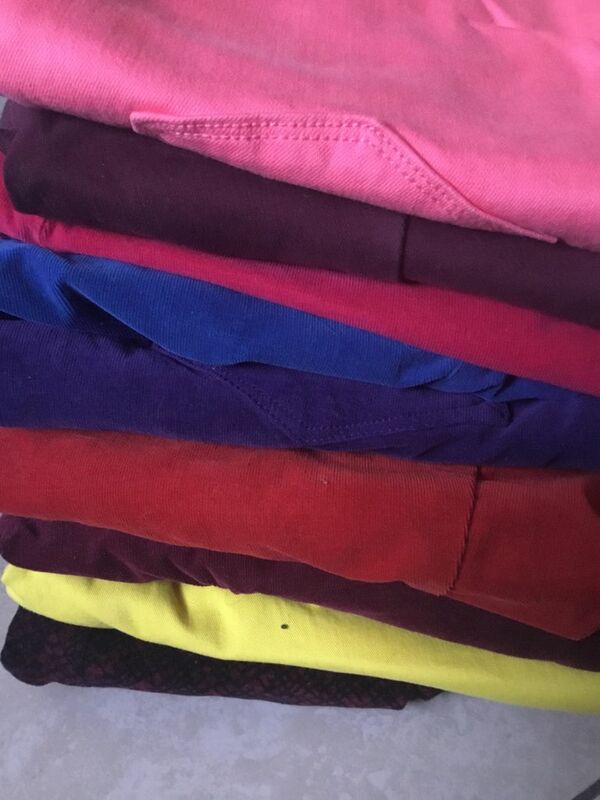 Love your colorful choices. I ordered the BR tee in black. The AG jeans look promising but my size is not available in the lighter blue color I want. Thanks for the reviews. bonnie, rotten luck. It's a good jean and selling fast. My error! I hope you will get the blazer too. You need an orange suit! That Cashmere looks gorgeous!! Your potential outfit looks stunning too. We don't get a lot of cashmere here - all either lambswool or merino so I have never owned a cashmere item. The swishy cobalt dress is so “you”, I’ll bet it looks fabulous. Did you ever try the Boden denim shirt dress? Been waiting to see what your thoughts were on that one too. Thanks for this additional round up! What is the COS sizing like? The treasure and bond pull over looks excellent. Some bright pieces for your spring. Hope the yellow and skirt work out too. I considered the green Boden dress. I’m also trying to be practical and focus on some less dressy dresses that fit my life better. I did wonder about the Boden Jersey midi you’re keeping, but I couldn’t decide if I like the hemline or not for me. And I’m trying to rein myself in a bit. Glad to see it worked for you though. Ooh. Such detailed reviews. I like the blue polo. And those red jeans (I have a pair of red l’agence on order already) come in a fascinating turquoise green. Quick question- the Boden Hambledon pants seem to run a size (or maybe more) large, based on the garment measurements. Does that fit with your experience, since you were sized out? Salivating over the Boden pants. Do you think it would be good for a petite pear? Looking for something between a wide leg and a palazzo. A friend of my sister’s designs and manufactures habitual. I’ll pass on your feedback about the weird fit. They have odd fit models. Of course the fit is perfect for my sister. Thanks for the reviews. They always help, although different body shape. I follow your lead in starting early. If we get another year with months of summer weather I want to be prepaired. I am looking for wide legged cropped/ culottes trousers, dresses and flowy tops that keep you covered but are interesting. Looking forward to seeing you model the new finds-especially the skirt and the bright happy outfit! I'm (probably) going to wait on summer additions til May, when I'll be able to wear them straightaway! Some beautiful additions to your wardrobe. I REALLY hope the KM skirt is a winner, because that looks so perfect for you. As for the orange suit, I also love that for you, especially with your Dutch heritage.